Fair enough, but you've got to delve deeply into American history before slamming programs designed to eliminate racial inequality. Why was there a need for Affirmative Action in the first place for instance? It was enacted to address structural, systemic exclusion of groups from education and employment. And as a result of it being discarded in many places, those same institutions are back to their practices of exclusion. Will that advance or set back society as a whole? Did you know that white women were the greatest beneficiaries of Affirmative Action? Look it up because it helped tremendously in issues regarding women being excluded in education, the military and employment. Just look at the Charter school choice programs which are merely an evolution of separation by race. After Brown vs Board of Education was won, many white parents sent their children to either religious or private schools to continue the practice of racial segregation. Remember 6 year old Ruby Bridges had to be escorted to school by federal agents after school desegregation due to angry white mobs threatening to kill the 6 year old child. Eventually they were able to use vouchers to exclude their children from attending schools with minorities. As a result, many public schools are now underfunded and failing, while still racially segregated. How does this benefit the greater society as a whole? And even by studying the censuses from the early to mid 19th century, you'll observe that in many states there was more racial harmony than there is now. Segregation and Jim Crow laws have been hard to eradicate and undo when you have active groups such as the Daughters of the Confederacy literally changing history books and revising what's taught in schools on American history. But when you constantly post black crime statistics, what are you as an individual trying to accomplish? What's the goal of frequently posting them? I doubt that you constantly bombard your black coworker with these crime statistics unless you're intentionally trying to offend him and hold him responsible for an entire group of people, as though they're a monolith. The majority of people from all races are not criminals. But those from the most violent, over policed, poverty stricken, neglected communities are bound to end up caught up in crime statistics, often times as the victims of such crimes. Yes you are still deaf, dumb and blind all by your own admission. At least you know what you are... willfully. Disparities are evident at the initial point of contact with police, especially through policies that target specific areas and/or people. A popular example of this is “stop, question, and frisk.” Broad discretion allowed to law enforcement can aggravate disparities. Though police stops alone are unlikely to result in a conviction that would lead to a prison sentence, the presence of a criminal record is associated with the decision to incarcerate for subsequent offenses, a sequence of events that disadvantages African Americans. Jeffrey Fagan’s work in this area found that police officers’ selection of who to stop in New York City’s high-profile policing program was dictated more by racial composition of the neighborhood than by actual crime in the area.31) The process of stopping, questioning and frisking individuals based on little more than suspicion (or on nebulous terms such as “furtive behavior,” which were the justification for many stops) has led to unnecessary criminal records for thousands. New York’s policy was ruled unconstitutional in 2013 with a court ruling in Floyd v. City of New York. Still other research finds that prosecutorial charging decisions play out unequally when viewed by race, placing blacks at a disadvantage to whites. Prosecutors are more likely to charge black defendants under state habitual offender laws than similarly situated white defendants.34) Researchers in Florida found evidence for this relationship, and also observed that the relationship between race and use of the state habitual offender law was stronger for less serious crimes than it was for more serious crimes.35) California’s three strikes law has been accused of widening disparities because of the greater likelihood of prior convictions for African Americans. It's only a reaction to the obsession the media and the government and society have with unrealistically promoting blacks and minorities, "celebrating diversity", holding a candlelight vigil every time a black is killed, broadcasting a news bulletin every time a black person accomplishes something academic or scientific, supports the racist policies of affirmative action, bonus SAT points, or quotas, or jumping to conclusions that whites are to blame for every problem blacks have or have ever had. And, you've gotten used to the cowardly white wusses who are to afraid to push back on how their world is being destroyed by immigration. We're not supposed to talk about certain things. We're not supposed to advocate for anything white because that's RACIST. White student union, white scholarship, congressional white caucus, bonus SAT points for whites, white only dorms, white only graduation, Society of White Engineers.... RACIST WHITE SUPREMACIST.
" Blacks have had 100% equal rights since 1964." In 1971 I was thrown aboard a Navy transport ship where the blacks were forced to sleep in their own compartment called lower deck because the whites slept in upper deck, one floor above. This was the beginning of my education on racism in the government. Later on, I was thrust into a Government Services Administration program designed under the direction of Admiral Zumwalt and President Jimmy Carter to ferret out systematic racism in the services including our civilian associates. Being a white person I had an entirely different perspective than my minority team members. The question today, is does racism exist in our society ? Some people call out something they label reverse racism. IMO racism comes from every ethnic group. My fervent hope is we are learning from our past mistakes and more diligently striving to overcome the prejudices of our forefathers promoting the shades of prisms inherent in our cultures !! "...most student unions, the "Freedumb Caucus", college dorms and professional societies are already only white." But not "white only". Not because they prevent blacks from joining, unlike the Congressional Black Caucus: "..former and current members of the caucus agreed that the group should remain "exclusively black". ...Rep. William Lacy Clay, Jr., Democrat of Missouri, the son of Rep. William Lacy Clay Sr., a co-founder of the caucus, said: "Mr. Cohen asked for admission, and he got his answer. He's white and the caucus is black. It's time to move on. We have racial policies ..."
"Why do you think there was ever a need for minority associations, caucuses, dorms, etc.? It was due to racial exclusion" Yes, 150 years ago. Not anymore. Blacks have had 100% equal rights since 1964. No excuses. And, despite the equal rights (actually not equal since trillions of dollars have been spent on trying to elevate them), affirmative action, quotas, black colleges, etc blacks continue to reside at the bottom of almost all socioeconomic measurements. Thanks for revealing your true level of resentment against African Americans, I expected nothing less from you. White student union, white scholarship, congressional white caucus, bonus SAT points for whites, white only dorms, white only graduation, Society of White Engineers.... RACIST WHITE SUPREMACIST. Newsflash, most student unions, the "Freedumb Caucus", college dorms and professional societies are already only white. Why do you think there was ever a need for minority associations, caucuses, dorms, etc.? It was due to racial exclusion and white supremacy which people like you continue to promote. And white people who stand for diversity and inclusion are hardly wimps. Recognizing that African Americans contributed to the formation of this country before the mass immigration of Europeans through Ellis Island, is a fact. Blacks have had 100% equal rights since 1964. If African Americans have had 100% equal rights since 1964, then the Voting Rights Act of 1965 wouldn't have needed to be passed or the Loving v Virginia act of 1967, nor would there have been a need for the Fair Housing Act of 1968. And ridiculously racist groups such as the damn Daughters of the Confederacy wouldn't have erected monuments celebrating slavery each time an important civil rights decision was made, to protest them. There's still school segregation occurring on a national level today, voting rights are still being stripped away today, racial bias in police departments is still an ongoing issue and sentencing guidelines are still being addressed today. The wealth gap has only grown since millions of African Americans were intentionally targeted for subprime mortgage loans before the Great Recession. What's obvious is you live in a bubble not grounded in reality to state that blacks in this country have had full equal rights since 1964. Literally thousands of cases of racial prejudice in the work place, housing, in education and of course in policing, have resulted in multimillion dollar settlements because rampant racism certainly continues in this country. And that level of racism reared it's ugly head when Barack Obama was elected twice. Racist whites had a field day with racist memes, jokes and social media posts that got a number of them fired. The birther in chief Trump led the charge that Obama was a secret Muslim that wasn't born in Hawaii. Trump finally stated towards the very end of his campaign, that Obama was in fact born in Hawaii with no apology whatsoever for his offensive, bigoted conspiracy theory. Election officials in North Carolina were found guilty of suppressing black voters in their districts with almost surgical precision according to the judge who ruled in the case. Georgia Secretary of State Brian Kemp rolled over 300,000 black voters off of the voting rolls to secure his election, which is still being challenged. So no, blacks have not had 100% equal rights since 1964 and white supremacists have made certain in every instance they could, that they still don't. There were 15 shooting deaths by police of unarmed black men in the United States in 2018, according to official data compiled by The Washington Post. An armed black man is about as likely to be struck by lightning as he is to be killed by a cop. Both are extremely rare. FBI data show that in 2017, there were 2,627 murders of blacks by other blacks in the United States. Just 0.01 percent of the murders of blacks in the United States are from officer-involved shootings. In other words, 99.99 percent of murders of blacks in the United States are non-police related. This is a huge mistake; 2015 saw a disturbing rise in murder in major American cities associated with “depolicing” in response to intense media and public scrutiny of police activity. In 2015, a black person was 2.45 times more likely than a white person to be shot and killed by the police. A Hispanic person was 1.21 times more likely. 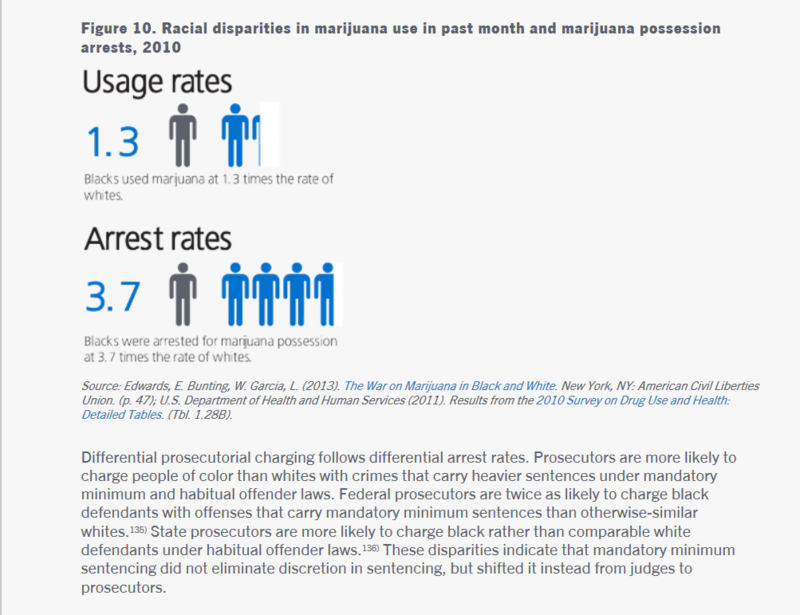 Different racial groups commit crime at strikingly different rates. Nationally blacks were seven times more likely to commit murder and eight times more likely to commit robbery than people of other races. In 2013, California blacks were 5.35 times more likely than whites to be arrested for violent crimes, and 4.24 times more likely to be arrested for property crimes. Are you SURE you want to mellow out on police stops? A five-year study of non-felony arrests in San Francisco found that blacks were 9.6 times more likely than whites (including Hispanics) to be charged with resisting arrest, and whites were 8.6 times more likely than Asians to be so charged. In Chicago, from September 2014 to September 2015, blacks accounted for 77 percent of arrests for obstruction of justice and resisting arrest, meaning they were 6.8 times more likely than non-blacks to be arrested on these charges. National Crime Victimization Survey, (number); Bureau of Justice Statistics, “Criminal Victimization, 2013,” Appendix Table 1. Dude, all you write is that blacks are in prison more than whites - even though they are a much smaller percentage of the population. That just goes to show you how criminal blacks are. Blacks are arrested more for drug offenses than whites because they're arrested more for other things like robbery. When they're arrested for robbery and they're found with drugs, they also get a drug conviction. Drug use is performed by survey so while blacks and whites say they take drugs at the same rates, drug tests indicate blacks lie about it and take a lot more drugs than whites. It is so disappointing and disgusting how many crimes blacks commit and how destructive it is on their community. I feel bad for black kids since so few of them have dads.